If you are missing a tooth, or teeth, then the surrounding teeth can shift position filling the gap and could cause your jawbone to breakdown. This can lead to serious health problems. 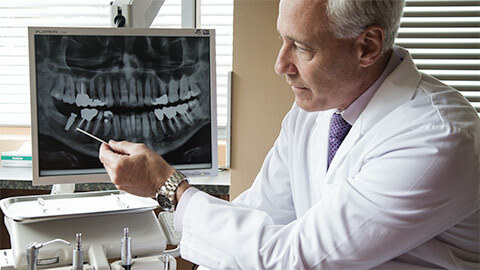 However, a dental implant is a safe, strong and natural looking solution to the problem and will prevent further complications resulting from a missing tooth. A dental implant consists of two parts, a small titanium fixture that is attached into the jawbone to act like the “root” of your new tooth, and an artificial tooth or crown. After the titanium fixture has been implanted, and sufficient healing time has passed, the crown is attached, restoring your smile and providing all the function and appearance of a natural tooth. 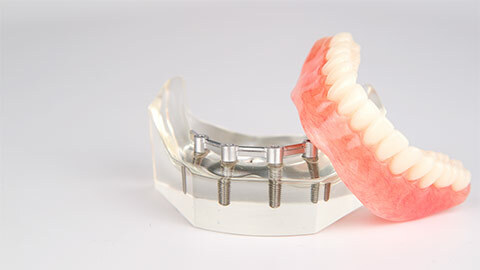 As your SE Calgary dental implant experts, we can also use implants to secure partial or full dentures so that they don’t shift around in your mouth. With our expert dentists taking care of you, there is no reason to be embarrassed about the gap in your smile created by a missing tooth. 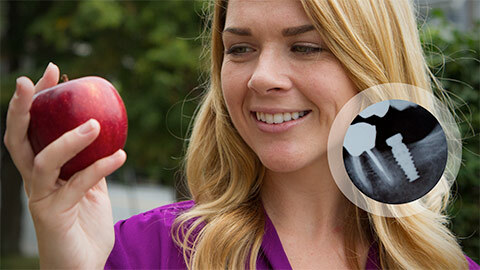 Dental implants offer a superior and permanent replacement for a missing tooth.